"You like boat ride to Yangshuo? River very beautiful." This was our introduction to "Mike," a very earnest entrepreneur, who wanted to take us from Guilin to Yangshuo by boat. Having just completed 24-hours of travel from Hong Kong to Guilin, including several bus rides and a bus-car fender-bender, the thought of another bus was rather repulsive. Mike had himself some customers. The group included five British friends from the train, and us. After we paid for the boat trip, Mike ushered us into a restaurant for breakfast while he set off to find - what else - a bus, for the “quick ride” to the dock. Eventually, Mike showed up with a rusting mini-bus, into which we all climbed, thankful to be on our way at last. Mike looked pleased, and we were relaxed, as we looked forward to floating down the river in a few minutes. After an hour of twisting dirt roads, we reached the boat-less dock. As Mike hurriedly shouted into his mobile phone, we contented ourselves with the stunning views of the Karst topography for which the region is famous. Twenty minutes later, Mike ushered us onto a small, ramshackle boat, complete with a surly, chain-smoking captain. Although we were shaking our heads at Mike’s organization and planning, everyone was ecstatic at the upcoming boat trip down the stunning Li River. Half an hour later, the boat shut down its smoke-belching engine, and we approached a much bigger craft. Without explanation, Mike told us that we would be switching boats for the rest of the trip. Since the new boat was clearly an upgrade, nobody questioned this, and we clambered aboard. Things were looking up. Yet, only 40 minutes later, the new boat pulled to a gentle stop on a sloping sand bar next to two traditional Chinese bamboo rafts. Mike explained: “We now take bamboo raft. You no pay extra.” Clearly, this was supposed to be a treat for us. With little choice, we climbed down on to the rafts under the watch of the two Chinese boatmen waiting to pole us down the river. 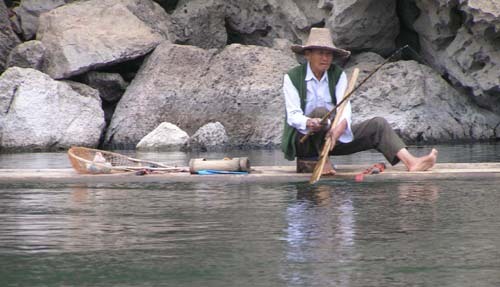 Although we were a little frustrated with our friend Mike, the bamboo float trip was amazing. We quietly floated down the river between soaring limestone pinnacles, greeting the local fishermen, and snacking on fresh cut local fruit. This was much better than the loud, belching boats we had utilized earlier. Unfortunately, all good things must come to an end, and our rafts soon inexplicably landed near the village of Xingping (pronounced Shingping), many miles north of our destination. When queried about this sudden stop, Mike explained for the first time that we would be taking a bus the rest of the way. Having learned that we would never understand Mike, we looked around at rough dirt road running through rural China, and simply asked where the bus was. “Only 10 minute walk,” came the response. So walk we did, carrying our full packs, and chatting with Mike about the area (interesting fact: the picture on the Chinese 20 Yuan bill is from Xingping). 25 minutes later, we reached the center of Xingping, and boarded a minibus for what we hoped would be the final leg of our journey. Eventually the bus lurched to life and we drove the final 30 km stretch into Yangshuo. The journey was long, circuitous, frustrating, and difficult. It was also peaceful, dazzling, educational, and unique. Mike wasn’t much of a businessman in the American sense. We had no organization, no disclosure, and little explanation for the method to the madness. Yet, Mike understands one thing – the Journey is as important as the destination. He provided an experience that could never have been duplicated on a slick, organized tour boat. Mike wasn’t perfect, but we are glad we met him. Enjoy the photos of our journey to Yangshuo. I'm living vicariously through you guys for the next 2 months. December 31st isn't soon enough! Did you guys try the turtle soup? Love your pics and movie. Keep it up! I tried to post once before and it seemed to not have worked. I'm living vicariously through you for the next 2 1/2 months. You guys are on quite the adventure. I can't wait to be on our adventure!